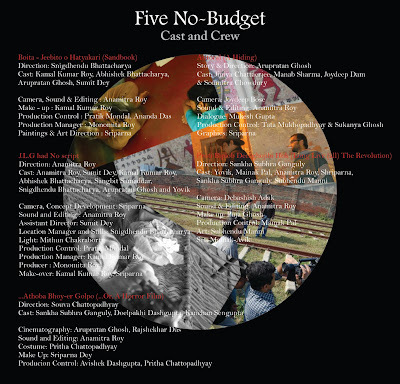 We are happy to announce that a DVD containing all the five no budget films will be released on 30th January, in Kolkata Book Fair 2010. The price of the DVD is Rs. 100/-. The DVD will be available at the stalls of Kaurab (Stall No. 405) and Natun Kabita (Stall No. 406). Trailergulo pratyekaTaai bhaalo laagalo. nabanirmaaNer prayaas taar gaaye gaaye aaThaar mata. sadya jal theke tolaar udbhaabanaaghraaN gaayer aa`nshe aa`nshe.